General purpose of this article is to discuss how to write Press Release. Press Release is a public relations announcement issued to the news media and other targeted publications for the purpose of letting the community know of business developments. 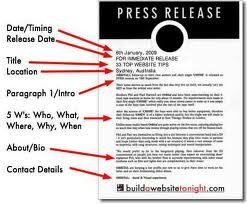 A press release is a written statement to the media. It can announce an array of news items, which includes scheduled events, personal promotions, awards, new services, sales accomplishments, and so forth. It can also supply to generate an attribute story. Reporters will consider a story idea as long as they first receive a news release. It is important tool of public relations work, one that anyone who’s ready to use the proper format may use.